The United States defeated the British Empire in 1783 and in the subsequent peace treaty, boundaries were drawn between the new nation and Britain’s North American colonies. Britain retained its claim to present-day Canada but much of the western Great Lakes region became disputed territory. Following the American Revolution, the US competed fiercely with Great Britain for control of the North American fur trade. It was in 1804, during this period of territorial dispute, that the Ojibwe allowed the British North West Company to establish the Snake River Fur Post. After the War of 1812 there were three main parties involved in the Upper Mississippi fur trade: Native Americans (primarily the Dakota and Ojibwe), the fur trading companies, and the US government. These parties worked together and each had something to gain from a stable trading environment. By 1823, the American Fur Company controlled the fur trade across much of present-day Minnesota. The company’s headquarters was at the confluence of the Minnesota and Mississippi rivers, at a post called New Hope, or more commonly called St. Peters. Today it is called Mendota, derived from the word Bdote. Treuer, Anton. The Assassination of Hole in the Day. St. Paul, MN: Minnesota Historical Society Press, 2011. 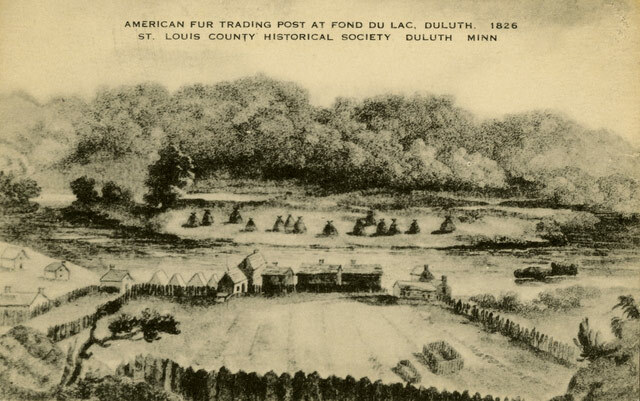 American Fur Trading Post at Fond du Lac, Duluth, 1826. American Fur Trading Post at Fond du Lac, Duluth, 1826. Source: MNHS Collections. 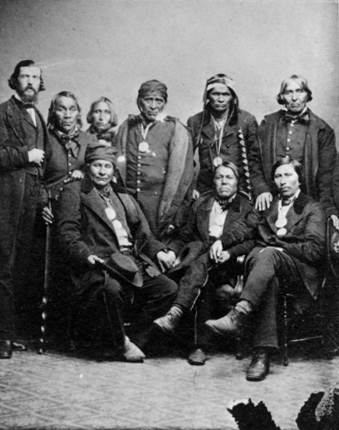 Ojibwe men, possibly at 1857 or 1862 treaty signing in Washington D.C. Ojibwe men, possibly at 1857 or 1862 treaty signing in Washington D.C. Source: MNHS Collections. 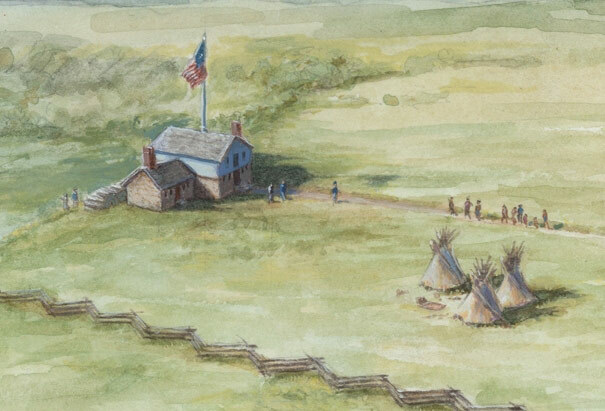 Fort Snelling at Bdote, painted by John Casper Wilder, ca. 1844. 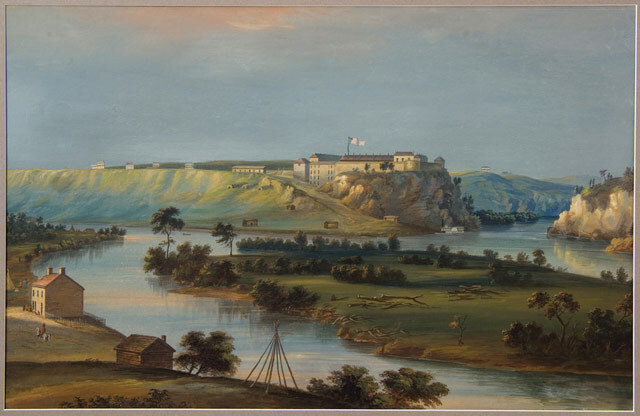 Fort Snelling at Bdote, painted by John Casper Wilder, ca. 1844. Source: MNHS Collections. Indian Agency Council House, 1835–37. Painting by David Geister, 2012. Source: Historic Fort Snelling collections.